Disney princesses are nothing new, but this movie is generous: It has not one, but two. Loosely adapted from a 19th century Hans Christen Anderson folk epic, Frozen marks a return to the buoyant, song-filled fairytale-fantasy format that became a Disney hallmark in The Little Mermaid (another Hans Christen Anderson fable) and Beauty and the Beast. 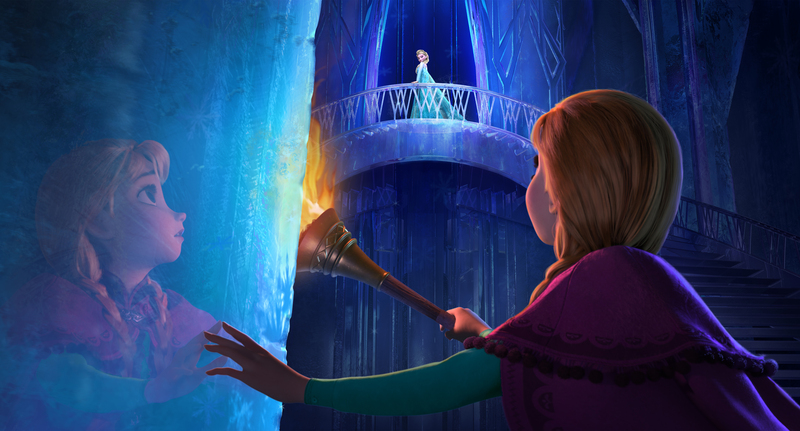 Here, a pair of young royal daughters, Anna (Kristen Bell) and Elsa (Idina Menzel), grow up apart, sequestered from each other in their sprawling Nordic palace after an unfortunate childhood incident reveals the dangerous darker side of Elsa’s mysterious “gift” to deep-freeze anything she touches. When the girls become young women and Elsa is reluctantly crowned queen, her coronation ball ends in an unplanned eruption of her powers. Accidentally turning summer into winter and perma-frosting her entire kingdom, the “ice queen” flees to the top of a desolate snow-swept mountaintop. Some of the townspeople think Elsa’s a “monster.” Her little-sis princess, insisting she’s just misunderstood, sets off to find her. Along the way, Anna meets a helpful ice harvester (Jonathan Groff, from TV’s Glee), his trusty reindeer Sven, and a goofy, gabby snowman, Olaf (Josh Gad), who longs to experience the warmth of summer—without realizing what heat can do his cool composure. The songs woven into the storyline are almost all standouts, signaling a new batch of Disney musical cream rising to the top. They’re from the husband and wife songwriting team of Bobby and Kristen Anderson-Lopez. Lopez has won Tony Awards for his Broadway work, and the tunes in Frozen likewise sound like they’re just waiting to be launched into a lavish, long-running stage production. The story sags a bit in places but comes through with plenty of humor, heart and a couple of rousing action scenes, including a thrilling chase by snarling wolves through a predawn forest and an encounter with a fearsome snow monster. And the computer-generated animation is impressive, with many dazzling cinematic variations on the “beautiful, powerful, dangerous, cold” ice themes noted in the opening musical number.